Phil: As the festive season turns inexorably toward the new year. I find myself looking for some hope in 2012. Hope that our book will find someone who loves it whose name isn’t either Nolan or Parker. Hope arrived this morning on the radio. There was mention of the classic Christmas film, “It’s a Wonderful Life”. You’ll know it of course, George Bailey suffers as things go very wrong for him and decides at Christmas to chuck himself off a bridge because the world would be better if he’d never been born. His guardian angel, Clarence, arrives and give him the chance to see how mistaken he is. The world would have been a much worse place without George. By the end he realises this, is saved, returns to his family and then is surprised by the rest of the townsfolk showing their appreciation of his efforts. Queue happy ending. The film is based on a short story by Philip Van Doren Stern called “The Greatest Gift” written in 1943. Unable to find a publisher, he turned the story into a 21 page Christmas card and sent it out to 200 friends. One of the cards was given to RKO Pictures producer David Hempstead who showed it to Carry Grant. He liked it and immediately saw himself in the lead role. 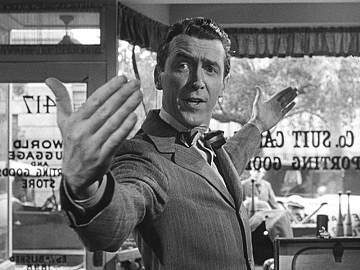 From that point, the rest is history – although in the end, Bailey was played by James Stewart as Grant was already making a different Christmas picture, The Bishop’s Wife. I think the moral I want to take from this is that unconventional means can get your book published. Maybe if we stop doing what we are supposed to do, which plainly isn’t working at present, and try something else, we’ll get a result. Maybe what we have written is a great screenplay that will be filmed, become a blockbuster, and then someone will be tasked with the novelisation. If we can get George Clooney in one of the lead roles, then at least one of us will be happy.